In her new book, The Irony of Power: The Politics of God in Matthew’s Narrative (Pickwick, 2017), Dorothy Jean Weaver ’72, professor of New Testament at Eastern Mennonite Seminary, brings together essays on a theme in the Gospel of Matthew that has preoccupied her for much of her working life. The book also serves as a valedictory for Weaver’s three-plus decades at EMS. Last January, she announced to her seminary colleagues she would not seek renewal of her contract upon its expiration next year. In addition to being the senior member of the EMS faculty, Weaver owns the distinction of having been the first woman to hold a full-time position at the seminary. She was named an instructor in 1984. Three years later, after receiving her doctorate in New Testament from Union Presbyterian Seminary in Richmond, Va., she was appointed to an assistant professorship. In her prologue, Weaver says that, throughout her career, she has found herself returning again and again to “the same set of urgent and persistently relevant ‘real-world’ questions” – namely, those concerned with issues of power and powerlessness, violence and nonviolence, and the ways in which the “politics of God” confound human expectation. What Weaver calls her “central insight” – that the Gospel of Matthew’s “ironic subversion of all standard definitions of political power” is directed toward the proclamation of a new “God’s-eye” vision of such power – is one that “has continued to energize” her study of Matthew since the early ᾿90s. At that time, her attention was first drawn to a paradox in Matthew’s version of the “Good News.” Why could the Gospel’s three great autocrats – Herod the Great, Herod the Tetrarch, and Pilate – not accomplish their declared objectives? For instance, in the story of Herod the Great (the menacing potentate in the account of Jesus’ birth, and the flight of Jesus and his family to Egypt), we read of a despotic ruler who is frustrated in his attempt to kill the infant child about whom he has heard a messianic prophecy. 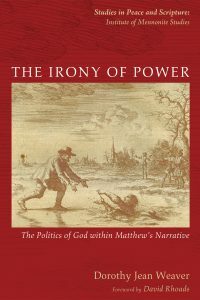 This and other examples of the irony Weaver finds at the heart of Matthew’s Gospel – and, indeed, the entire New Testament – formed the basis for her essay titled, “Power and Powerlessness” (originally published in 1996), and ultimately, she says, for the other essays collected in The Irony of Power. Yet it was not until her sabbatical at Jerusalem’s Tantur Ecumenical Institute in 2010-11 that Weaver first began to explore the idea of bringing the essays together in a single volume. There she received encouragement from noted Old Testament scholar Samuel Pagan of the Jerusalem Center for Biblical Studies. Expressions of enthusiasm also came from such prominent colleagues and associates as Willard Swartley, professor emeritus of New Testament at Anabaptist Mennonite Biblical Seminary, and David Rhoads, professor emeritus of New Testament at the Lutheran School of Theology in Chicago. Throughout Weaver’s career, teaching and scholarship have been coupled with personal peacebuilding in a part of the world notoriously resistant to such initiatives – the Middle East. Since 1995, she has led 18 tours of the region, and has spent multiple sabbaticals lecturing and conducting research in several of its most prominent centers for the study of biblical texts. “My experiences in the Middle East have sensitized me profoundly to issues of power and powerlessness,” she says. Weaver recalls a moment of sharp clarity from another sabbatical she spent at Tantur in 2003. The window of her room looked out on a valley; on a hilltop at its far rim, Bethlehem was visible. Weaver has announced that, although she will leave full-time teaching in May, she plans to continue leading the EMS Middle East cross cultural experience, as well as the Virginia Mennonite Missions Nazareth/Bethlehem work group in alternate years during the EMS May Term. Weaver says that her direct involvement in peace and justice initiatives, and the time demands they have entailed, caused to her realize long ago that she would “never have a long shelf of books.” Nor does she necessarily regard the present volume as her magnum opus.